The Life of Bon: This is a Mormon Announcement! This weekend Mormon history was made. Every six months us Mormons like to gather together round our television sets and watch tv for eight hours. It's called General Conference. Instead of going to normal church on Sunday, we have four sessions of "conference", a Saturday morning and Saturday afternoon session, and a Sunday morning and Sunday afternoon session. Most members try to catch at least part of the broadcast if not all of it. I realize that to those outside of the church eight hours of church broadcasts sounds absolutely insane, but it's actually wonderful. We get to stay home in our pjs, eat food all day, and hear inspired counsel from the prophet, the 12 apostles, and other church leaders. So yah, I don't mind conference weekend one bit! This conference session, in addition to all of the normal feel good stuff that normally goes on during conference, had a special announcement. The president of the church, Thomas S. Monson, announced Saturday morning that the church would be lowering the minimum age required to serve full time LDS missions. For as long as I have lived, the age for missionary service has been 19 years old for men and 21 years old for women. This weekend it was announced that the age for men (boys?!?) would now be 18, and the age for women would be 19. It might not seem like much. But it is. It is a huge shift in the culture and lives of Mormons. Boys can now leave on their missions right out of high school. They can be home and done with their missions by the time they're only 20. Girls (who serve for 18 months as opposed to the 24 months the boys serve) can be home by the time they're 20 too! This works out perfectly for high school sweethearts- they can pretty much go on their missions at the same time, come home and tie that knot tight! No more of the girl "waiting" for the boy to get home from his mission- something pretty common in Mormon culture- instead they can both go! I think the hugest difference that will come with this announcement is that there will be more women missionaries. 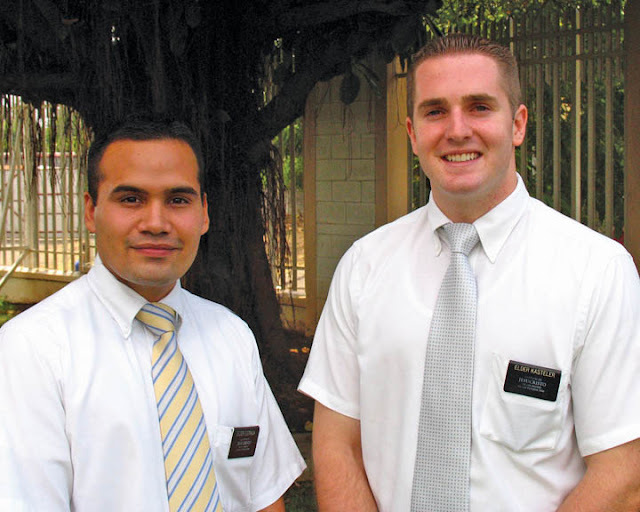 I'm sure you've seen LDS missionaries around your neighborhood, and most likely they have been men. This is because missionary work is something that is asked of all men in the church, but is optional for the women. Because it is optional, and because women can't serve until they are 21, many women decide not to go. By the time women are 21, many are deeply immersed in their college studies, dating seriously, or in some cases, even married already. By lowering the age to 19, church leaders are essentially making it "easier" for women to go. There's always been a stereotype inside the Mormon Church that girl missionaries are the frumpy ones who couldn't get married. I anticipate that now that women don't have to wait so long to go, many more will serve. The stereotype will change from the "girls who couldn't get married" to the "girls who are passionate about their religion." "Girls, you can do it all! Go on a mission! Get an education! Get married! Have babies! I love this day. No longer an either/or." I can't say enough about how much my mission meant to me. (You can read about it here and here.) It was such a special time in my life- a period of time that was dedicated completely to figuring out my relationship with God. I wish everyone could have that experience. And now, it's that much easier. - The boys with nametags and bicycles around your neighborhood are now going to look even younger. - My guess is that within 3 years you will be seeing MANY more female missionaries. - More cute girl missionaries?!? -Your Mormon neighbors will now be getting married and having kids even earlier than before because now both the boy and girl can be done with their missionary service by 20! WOWZERS! Hubs thinks there might be a few more negative repercussions than the church bargained for- more homesick missionaries away from home for the first time, more missionaries who can't cook, clean, or manage their money, and more missionary "romances" (something that is most definitely not allowed while you are serving). So what do y'all think of the big announcement? I think that this will definitely be interesting to see what will happen with the MTC.... will it get overloaded? Will missionaries be put on backorder? Just musings that I have been thinking about. I think this is so amazing. for guys...i dont know its that big of a difference. but for girls...its amazing! i think so many more girls will go. I can't believe they changed the age! I just keep thinking about how happy I am the age was 19 when my boyfriend and I met...We would have never dated and fell in Love!!! It makes me want to be over-dramatic and CRY and think about all our lost moments! ahahah! I have never been so touched by an announcement. I am 20, and I have been wanting to serve now for over 2 years. However, as time has gone on and I've gotten more schooling under my belt, I kept finding reasons to put it off, started losing my resolve, and made a plan that I wouldn't leave until after NEXT Christmas--when I'll be almost 22! When President Monson made the announcement, I've never had a stronger impression in my entire life to change that timeline and leave in April! That was definitely a sign I couldn't ignore. I am so so so excited that I finally get to live my dream! This will help so many things-women will be more prepared for the challenges that come with marriage, and the occasional negative "unmarriable" stereotype I've heard that sometimes surrounds returned missionary women will no longer exist! (Although I know you served a mission, and you and your husband are adorable as ever!-Just a stereotype I've heard) Ah! I could not be happier about this!! Isn't it incredible? I know there is a special timing for everything-- but I can't help but think about what my life would have been like If I could have gone at 19. (I got married at age 20 so mission never was an option until I was older). SO exciting for all the women! As a non-mormon, I found this post VERY interesting! I was reading it out loud to my husband... It was very informative and gives me more insight into your religion. Thanks! My sister is LDS, so I guess all the Mormon news has a special place in my heart. I'm sorta excited about this announcement haha. I never thought it fair, the way they did the ages, and now it has so many positives to it! I LOVE this announcement!!! I had hoped to serve a mission but found myself at 21 in a very serious relationship and so close to being done with my studies so I decided against it. If I would have had the opportunity to serve at 19 I would have gone in a heartbeat! I think this is a great decision. As for the more romances in the mission field: I like to think that girls who choose to serve a mission are typically on the more mature side, so I kind of doubt that they will be entertaining the thought of romance. Maybe that's just me though? What a fun day!! I feel like this was perfect for my brother who graduated high school at 17 and is now at BYU. That kid is ready to serve a mission and I would hate for the long wait of a year and a half dull his desire. Of course I really wonder how this announcement would have affected me ten years ago when I was 19. . . maybe I would chosen to go. I am not a Mormon but I have been seeing lots of Tweets and posts from my lovely Mormon blog friends online about this change. I think that it's awesome that the LDS church has made this change for those that choose to serve. I think that allowing the women to go at the (almost) same age will definitely increase the willingness of women to serve. I was so excited about the announcement. It totally made sense because the conference after my husband and I got married they asked for more people to donate to the missionary fund in conference. I do wish they had announced it earlier, but I know that regardless, the answer I got about going was that it was still wrong. The numbers of girl missionaries applying to leave is crazy high right now! I mean it's totally expected with the new change, but my mom has been making lds missionary plaques for the better part of 10 years for missionaries who have calls, and she has never seen so many orders for girl missionaries with calls waiting to leave. It's pretty exciting!